Our goal is to connect people with the best local experts. We scored tree service professionals on more than 25 variables across five categories, and analysed the results to give you a hand-picked list of the best tree service professionals in Indianapolis, IN. Family-owned and over 30-year-old Danville business A Cut Above Tree Service guarantees lowest prices in the Indianapolis metro area. A range of options for residential and commercial clients includes tree removal, trimming, topping, shaping, thinning, and spraying as well as stump removal, landscaping, dirt and rock delivery, cavity filling, and ash borer treatment. A Cut Above Tree Service uses the most up-to-date equipment and prides itself on timeliness. Arbor Tree Company serves Greater Indianapolis, specializing in safe and efficient tree removal and lot clearing. The Indiana tree service business began more than 35 years ago with the most recent family owners operating for more than 10 years. Customers recommend Arbor Tree Company for its professionalism and careful treatment of property. Services include tree trimming, limited stump grinding, and emergency response. Arbor Tree Company is licensed, bonded, and insured. Artistic Touch Tree Service in Indianapolis specializes in difficult tree removal for Greater Indianapolis customers. 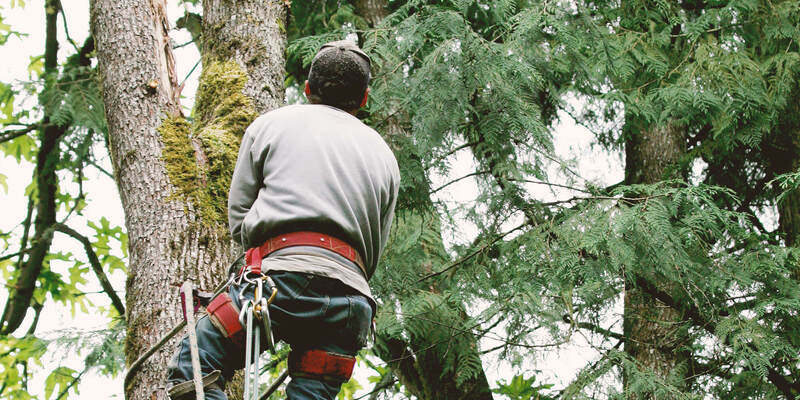 Services include tree pruning, shaping, dead wooding, and rope rigging. The staff includes a certified tree climber. Stump grinding is available through a subcontractor. Since its beginning in 1998, Artistic Touch Tree Service regularly has repeat customers and referrals. The business is licensed, bonded, and insured, providing storm clean up and 24-hour emergency services. One of the largest tree services in Indianapolis is Broad Ripple Tree Service. For more than 30 years, the business has served Indianapolis' downtown neighborhoods and surrounding suburbs. Broad Ripple Tree Services offer tree removal, pruning, cabling, bracing, disease diagnosis, injections, inspections, and assessments. Certified arborists and other tree care professionals have an outstanding safety record, numerous customer service awards, and a reputation for efficiency. Brownsburg Tree Care has served Indianapolis and surrounding counties for more than 10 years. The family-owned and -operated business’ services include tree removal, disease control, planting, root collar excavation, pruning, and fertilization. A certified arborist on staff provides skilled, knowledgeable tree health and preservation services. Brownsburg Tree Service emphasizes correct, quality workmanship and customer satisfaction above cheap tree care service. Free estimates are available. Local family-owned Budget Tree Care has served Hoosier communities in Indianapolis and surrounding areas for more than 30 years. Budget Tree Care professionals understand Indiana’s emerald ash borer problem and provide treatment. Other services include tree trimming and topping, tree removal with stump grinding, lot clearing, and storm damage cleanup. Budget Tree Care guarantees lowest prices, with senior discounts available. Indianapolis tree service business Complete Tree Care provides tree disease and insect identification, treating a variety of tree problems, including emerald ash borer infestations and leaf blight. The family-owned and -operated company serves residential and commercial customers. Complete Tree Care is licensed, certified, insured, fully equipped, and knowledgeable about Indiana tree specifics, serving Hoosier communities for more than 30 years. Services also include all tree maintenance, removal, and cleanup. Green Arbor Tree Experts serves the Indianapolis area, specializing in local tree maintenance and removal. Its owner founded Green Arbor in 2000 after more than 20 years’ prior experience with a large national tree and lawn company. The company is ISA certified and is state licensed, and employs certified arborists. Services include pruning, removal and plant care, meeting high professional standards. Green Arbor Tree Experts advises against topping trees. A family-owned tree service company since 1954, Griggs Tree Service serves Indianapolis and surrounding communities, treating all tree care needs. The company prioritizes improving tree safety and health, with services including tree disease detection and treatment, emergency tree removal, tree trimming and pruning, bracing and cabling, stump grinding and removal, cavity filling, and land clearing. Free estimates are available. Griggs also provides snow removal. Indiana Tree Service, Inc. is a near 15-year-old tree service business serving Indianapolis and surrounding areas. Tree services provided include trimming, pruning, lightning protection, cabling, bracing, and trump grinding. Indiana Tree Service advises against tree topping, suggesting safer, more economical alternatives. Additional services include stump grinding, fertilization and soil aeration, exceptional cleanup, and 24-hour emergency services. Indiana Tree Service’s certified arborist is available for tree health care consulting and services. Indy Lumberjack specializes in tree services to maintain safe and beautiful trees in Indianapolis, Noblesville, and surrounding suburbs. Client recommendations emphasize Indy Lumberjack’s careful, thorough and timely removal of dangerous trees from residential properties. The business provides a range of services focused on property safety and tree health, including tree bracing, trimming, and removal. Additional services include deadwooding, fertilizing, and stump grinding. M & M Tree Surgeons is a Cicero tree service company owned and operated by third generation professional arborists with more than 40 years’ experience. M & M Tree Surgeons specializes in treating trees through regular maintenance and, when necessary, removal. The certified business provides full tree service plans, including tree crown reduction, trimming and shaping, diagnosis and treatment, fertilizing, deep root injection, and appraisals and surveying. Martin Tree Service provides tree care to Greater Indianapolis. Tree removal services are a la carte, from simply getting the tree safely on the ground, to planting new grass or a healthy tree replacement. Martin Tree Service first assess if a tree can be saved before initiating removal. Emerald ash borer treatment is available. Martin guarantees lowest prices, providing veteran, senior citizen, and Angie’s List discounts. Internationally certified Menchhofer Tree Care has specialized for more than 30 years in protecting Indianapolis trees and plants. A full range of services includes tree diagnostics and treatments (such as emerald ash borer) as well as tree removal, pruning, spraying, cabling and bracing, installation, and stump grinding. Tree care employees are up to date on tree service techniques and professional standards. Menchhofer provides free estimates and risk assessments. Midtown Trees specializes in tree care and preservation in historic neighborhoods of central Indianapolis. Midtown’s certified arborists with more than 20 years of residential and commercial tree experience provide scientific, proactive, environmentally responsible tree services focused on supporting Indiana tree health and longevity. Tree removal, tree planting, and comprehensive tree health care services use up-to-date techniques and equipment. N & S Tree Services is a Greenwood business operating since 1995. Complete tree services emphasize tree care with pruning, trimming, and planting, as well as safe and efficient tree and stump removal. Skilled and knowledgeable professional arborists and other N & S staff members provide individualized, detailed services to support the health and beauty of customers’ trees and plants. N & S Tree Services provides senior citizen discounts and 24-hour emergency service. Ping’s Tree Service is the largest privately owned and operated tree care service in Central Indiana, and has operated throughout Indianapolis Metro area for more than 40 years. The team specializes in tree health care. Services include tree pruning and removal and protecting healthy trees against emerald ash borer. Certified arborists diagnose trees and are available for consultation, tree risk assessment, and appraisals. The company holds certifications from professional arborist and customer service associations. Customers recommend Stewarts Tree Service in Indianapolis and surrounding communities for its quality, fair pricing, and careful treatment of property to minimize yard damage. Services include tree trimming and topping, tree removal, deadwooding, stump grinding, and Mauget tree injections. Stewarts’ owner is present on all sites. The family-owned business began in 1980 and is BBB accredited with several Angie’s List awards and high ratings. The Stump Machine is an Indianapolis tree service company specializing in stump grinding and removal from residential and commercial properties. The Stump Machine also removes small trees, bushes, and root systems, and provides proactive tree services including planting and pruning. All tree services are environmentally responsible and 100% customer satisfaction guaranteed. Senior citizen and military member discounts are available.